The units provide peak efficiency up to 90 percent, depending on flow rates and the temperature of the incoming water being heated. 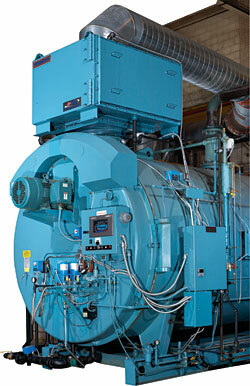 The lower section of the economizer recovers heat energy by preheating the boiler feed water. The upper section preheats a cool liquid steam. The control system then ensures maximum condensing when firing natural gas. When burning No. 2 oil, the control system automatically switches to a near condensing mode. The upper coil, lower coil, solenoid valves, modulating valves, control system and other system components are sized as a system to optimize cost savings.